A Post delivered by Mr. Liaquat Kamboh. 1.AOA, I want to know that an employees has been posted to an HRC, area but now working n remote area and his previous ceiling has been closed, weither he is entitle to draw the same now. 2. An employee availed HRC by submitting a third party agreament, a afterward/later stage his basic inreased n his 40% of basic go beyond the agreament, weather he is entitle to draw the difference. 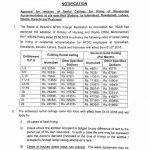 Is house ceiling hiring facility avail the employees appointed on Assistance Package? If yes, kindly given any order / circular for help. 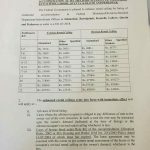 Salam to all .and special thanks to shumailakamal who has gather such imporatant document in the public interest. My qusestion is about Accomadation,allotment rules 2004.
whether assesment committe wil re asses the rent of the allotee in case of expiry of lease agreement of three years. Dear Salman just read the accommodation rules at mine site. 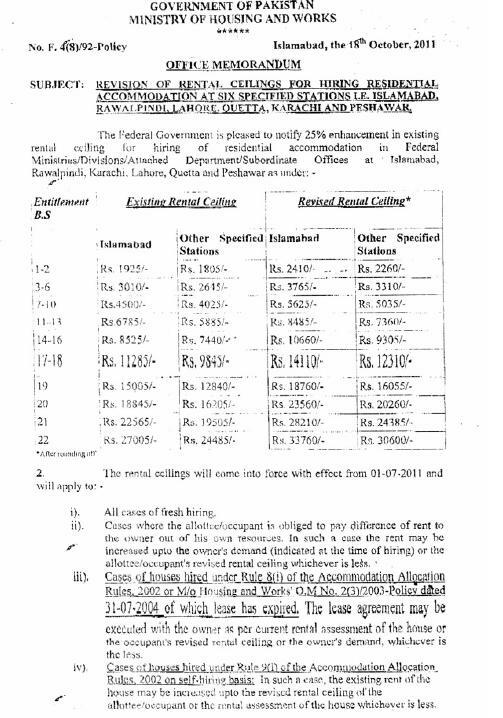 Plz clarify whether he is entitled to rental ceiling in light of above or any other rules? aoa madam i have seen a house in rural area of islamabad. my celing is 5625 and our Director F&A give me the @ 3765 coz my house is in rural area and i got 1 step below. now i found a justification that my require covered area is 500 sqf and my house is 1400 sqf. 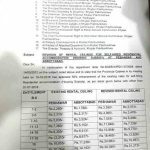 madam agar 500 require area hay and ap k pas is se ziyada hay tu apko ap k scale k mutabik house rent mily ga. per koi in writing may koi notification nahi hay. Now plz tell me if any notification about this matter. aoa? 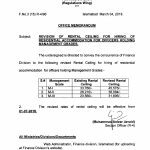 any body know whether this rental ceiling facility is also available to punjab govt employee? If any employee who was availing Self Hiring facility. Govt had issued the Six months rent and during that time period he expired i.e. after his expiry date 2 months were left for the six months. 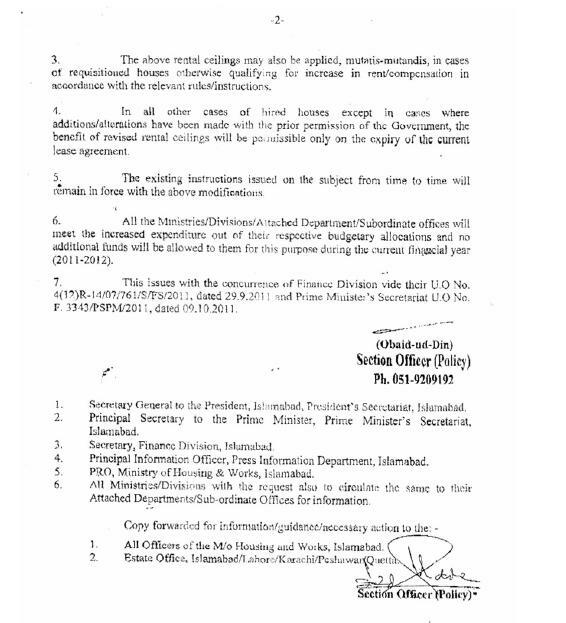 Govt according to Assistance Package Govt issued 5 years Rental Hiring for the said home which was on his name but now is on Succession certificate..
1. Will the increase rental ceiling will be applicable in his case (during Assistance Package 5 years) . 2. Is the Succession Certificate correct as Govt "Owners Willing Certificate". Is there any body to clear the issue of Batool. Plz comment here. 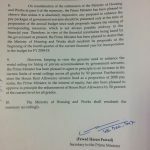 increasing in rental ceiling is not applicable in cases under Assistance Package. They will be treated as freez at last rent. 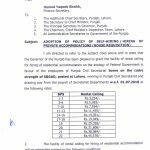 Dear Ghulam Mustafa, this notification was issued in 2011 and I published the same for the guidance of those who are new in these cities and also for the information of those employees who are not residing in these 5 cities mentioned in the Notification.